Add a block of markup using these special opening and closing comment markers. Use a forward slash (/) followed by an asterisk (*) and then a colon (:) for the opening comment. Use an asterisk followed by a forward slash for the closing comment. The lines in between the opening and closing comments can contain text, text and markup, or nothing. There is no limit to the number of lines. Text on same line of the opening comment is ignored. The following markup show a numbered list of the top three coffee producers of 2014. Use a forward slash (/) followed by two asterisks (*) for the opening comment. Use an asterisk followed by a forward slash for the closing comment. The lines in between the opening and closing delimiters can contain text, text and markup, or nothing. There is no limit to the number of lines. The opening comment line can contain text that will be concatenated with the contents of the line below the delimiter. This is the only case where lines are concatenated. 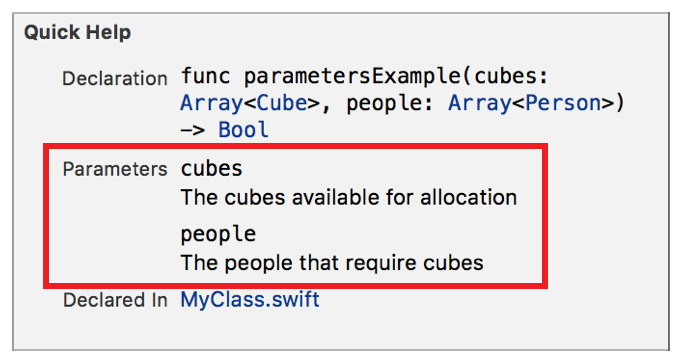 The following markup documents the cubes and people parameters.